Friendly, sociable, at times oblivious and happily ignorant, Tito finds little to complain about. Not even the condition (Hypermobility Syndrome) he was born with. As a child, his escape from reality was watching wrestling on television and in person. It was love at first sight. So much so, that it became an unhealthy obsession (with psychological effects) and a life goal to become a wrestler. At age 22, the dream had finally come true. Tito was vigorously trained by Mexican Luchadores for 5 years during which he was a fan-favorite jobber (wrestler who routinely loses). Even so, he still doesn’t understand a word of Spanish. In fact, he is under the impression that his luchador name, given by his first promoter, means The Silver Hawk. He is very proud of it. As a wrestler with immeasurable resilience, exceptional durability, and hypermobility, he quickly became the go-to Jobber in the wrestling industry. 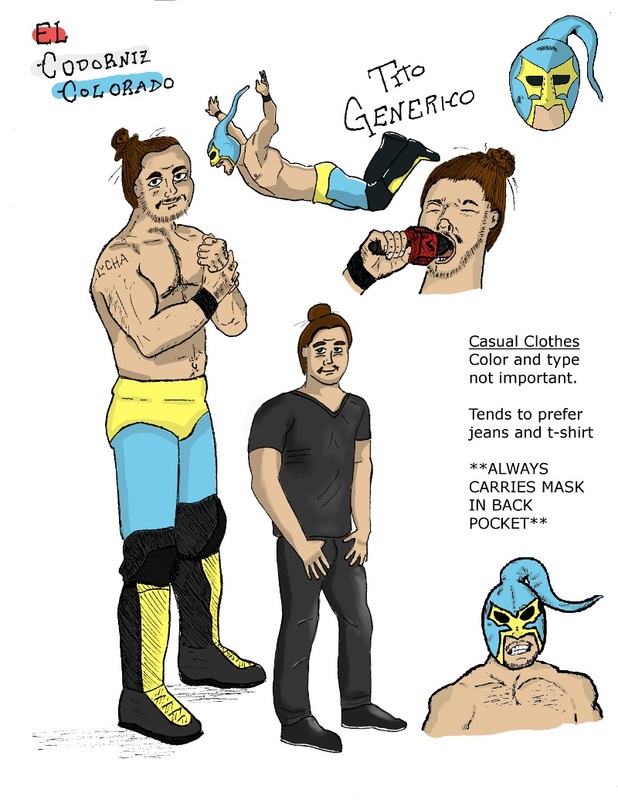 He is particularly proud of his glorious man-bun and had a luchador mask specifically crafted to house the beautiful bun and leave it unscathed after every match. Due to the mask's unusual shape, and his unearthly pain-tolerance leaving his body nice and red after almost every single match, he earned the work name El Codorniz Colorado (Red Quail). He sports a “LUCHA” tattoo across his right shoulder which is the symbol of a prestigious Lucha Guild. Luchadores Unidos Con Honor y Amistad (Luchadores United Coinciding with Honor and Amity). • Tends to perceive the world as a giant wrestling arena. • Rarely removes mask. Claims that it is part of him. • Yellow symbolizes immortality, optimism and cheerfulness. • The colors also represent the California quail. • Trim: Bird-like features that symbolize the quail.